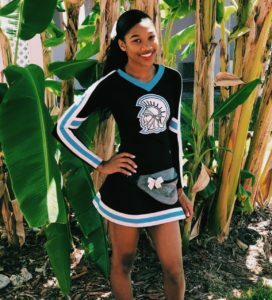 My name is Paris Richardson and this is my third year as a varsity cheerleader at Jean Ribault Senior High school. I have formerly cheered as an All-star cheerleader for five years starting at the age of eleven and ending at sixteen. My transition from All-star cheerleading to High school cheer has been substantial and something to remember. There are some major differences. 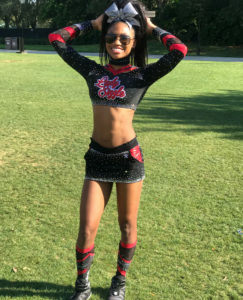 The biggest difference between the two consist of transitioning from 3 days a week of practice and practicing for only cheer competitions to practicing 2 days a week for football games, basketball games, pep rallies, competitions and preparing for special community appearances. Fortunately I didn’t have to leave the hairspray for high and firm ponytails and smoky eye, eye shadow alone completely because I was able to make our high school competition team. As a former level five All-Star Cheer athlete, competing with my high school’s varsity team is nowhere near the same. I have more fun competing now because we get to use more props than all-star; signs, pom poms and megaphones. As a varsity cheerleader, my new main job is to keep the crowd engaged while I cheer on our team to victory. The best part is that I get to also enjoy being on the competition team to do what I have done for so many years prior to high school. Lastly, being a part of high school cheering has also allowed me to make new relationships and to be a part of my high school community. Over the course of time between leaving All-star cheer and joining high school cheer my experiences have been amazing and in all, I love them both.